Over the years, US Academic Triathlon has asked students which event is their favorite. Surprisingly, the breakdown has always come out to be almost exactly split into thirds, with each of our three events taking an equal part of the pie. 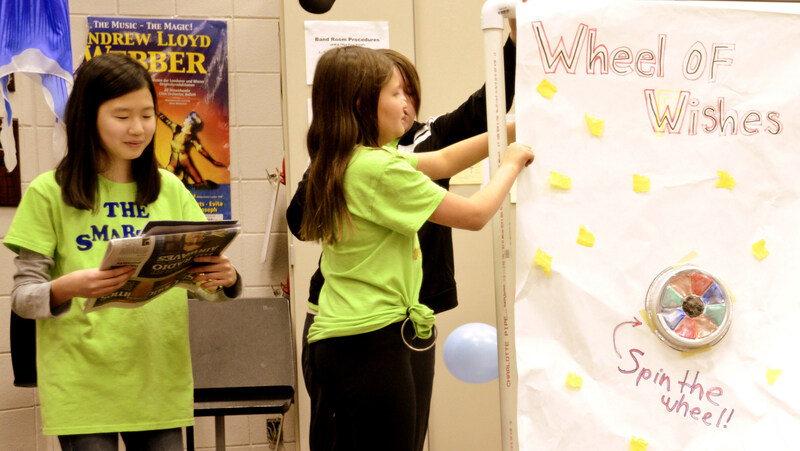 Last season we provided a series of tips for improving the skit planning and performances for these students who don’t find it quite so easy. In case you missed it or need a refresher before heading into the last Round Robin Meet on February 19, we’ve provided links for the series below. Looking for more creative ways for your students or child to reach their full potential? Stay tuned for our next series on Multiple Intelligences that starts next week! People spend a lot of time thinking about their own appearance. We wear make-up, iron our shirts, match our socks and do all sorts of things ranging from meticulous to menial when it comes to how we look. Humans make snap judgements based on how someone is dressed all the time, and there are ways for students to tap into this and use it for their own benefit during a P.A.R.T.Y. skit. If you have ever watched these short plays, you will have seen at least one student put arm and head holes into a garbage bag and wear it as a costume. The opaque trash bags certainly cover a student’s street clothes, but it doesn’t really do anything to inform the audience about who they are supposed to be seeing instead. This is where accessories become indispensable. With only a short time to prepare the skit and a short time to perform it, teams can’t afford to leave the judges guessing. There are many small, easy to make pieces that can be added to costumes in order to inform and delight the audience. And don’t forget, there is no rule that says the backdrop paper can’t be used in your costumes. 1. Ties. Making an entire suit for a character would take a long time, but there are many people who become much more recognizable if they are wearing this kind of formal attire. Lawyers, business people, generic “dad” characters, etc could all be delineated by adding a tie. You can add further interest by making the tie colorful or dull, patterned or plain, crumpled or immaculate. And there are, of course, many different shapes for ties. Most people would see a bow tie and go straight to scientist (thanks to Bill Nye, the Science Guy), or within a line or two this person would be easily recognizable as The Doctor from Doctor Who. A cravat or bolo tie would paint a totally different picture. 2. Head gear. When you enter a room looking for a king, what would you expect to see? Well, a crown of course! Hats are another accessory that can do a lot to define your character and don’t have to take long to make, though a very elaborate hat will definitely get the attention of your judges. You can use head gear to show someone’s job. For instance, football players, motorcycle drivers and stunt people all wear helmets. You can also use hats to quickly tell your audience where they are in time. In the 1940s, no one would be caught dead without their fedora, for example. 3. Masks. Totally covering the face can be tricky because it could be hard for the judges to see your emotions, but in the case of becoming something other than human, a mask can be invaluable. Want your alien to be more alien? Give it a green face! Does your story involve a pack of wolves? A mask would be a quick and easy way to give your wolves ears and fur without having a full body costume. Masks can be held in front of the face, or held on by a strap made from paper and tape. 4. Anything worn on the torso. The audience and judges will mostly be focused on the faces of the actors, and the next biggest space near the face is the torso. Even if you don’t have the right pants or shoes, decorating the torso of your character goes a long way to informing your audience. The epaulettes of a general, or instance, go on the shoulders, and a few metals on the chest would make it easy to recognize that this person is in the military. Even if your sheriff is missing his hat, a yellow star on the chest will tell the audience they are looking at the law in these parts. Even an over-sized “Hi, my name is …” badge can add characterization, and often humor, to a skit. 5. Belts. Like hats, belts can tell you about a person’s job. Plumbers, handymen, construction workers, even Batman, have distinctive belts that can be recreated in paper. Add a couple plastic cups and you’ve even got a place to store paper wrenches and screw drivers. 6. Don’t forget the box! Besides the backdrop paper, another building material that teams often overlook is the box that contains their P.A.R.T.Y. supplies. This cardboard is much more valuable as component of a costume or prop than it is to make it easy to carry your stuff! Cardboard is rigid, so it can give the appearance of armor for a samurai or knight. It can add bulk to a strongman in a carnival, or be the basis for comically large clown shoes. This is one of the materials you can always count on getting in a Meet, so why not practice changing it into costume components? Do you have other good ideas for adding distinctive accessories to costumes? Please leave us a comment by clicking the link below the title! Next week, check out PA.R.T.Y. in Box Time: Props add Pop for more ideas!